Coverage: Live commentary on BBC Radio Scotland & online. Live text coverage on BBC Sport website. 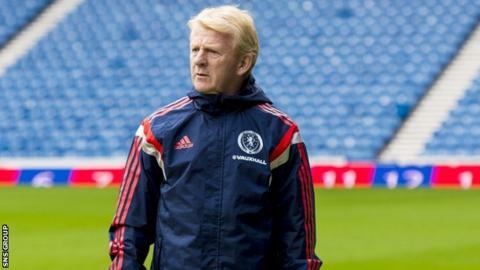 Manager Gordon Strachan believes Scotland are in "a good place" ahead of Saturday's qualifier against Georgia. And the 57-year-old remains upbeat about reaching the Euro 2016, although he refuses to set a points target. "We seem to be adding to the spring in the step of Scottish sports fans and that makes us happy," said Strachan. "The players make me feel confident. They determine the mood of the coaches most of the time and they have satisfied me this week." Scotland have not played at a major finals since the 1998 World Cup, but an upturn in results and an expanded tournament have raised hopes of a return to France the year after next. "How you get there, you never know," added Strachan, who was tight-lipped on his team selection. "You can't plan it. You never know when the big games are and when the disasters are coming. "You just have to deal with them and hope there aren't too many disasters." Scotland opened Group D with a 2-1 defeat by Germany last month, while Georgia lost by the same score at home to Republic of Ireland. However, Strachan is buoyed by a strong second-half performance against the world champions in Dortmund, a prior run of six games unbeaten and a largely settled squad. "Our performances over the last year have allowed us to feel good about ourselves," he explained. "We know we're playing against a good side who will probably consider themselves unlucky not to get anything out of the first game against the Republic. "I thought they did well and it took a wonder goal from Aiden McGeady to beat them. "We think we have players of that ilk that can do the same and if we can't do that then hopefully we can beat them as a team." Reflecting on last month's narrow defeat by Germany, Strachan put the heartening display down to continuity and improved partnerships in all areas of the pitch. "It's been a build up of 16 months to get a performance like we did in the second half," he said. "But we have to look at the first 20 minutes and ask what could we do better." Georgia are the fifth seeds in the group and come to Glasgow ranked 110 in the world, but Strachan has been as meticulous as ever in his approach. "We could put on the best performance you've ever seen by a Scottish side and the football gods decide you're not going to win - that happens," he added. "Or we could have a lucky day, not play well and score a couple of scruffy goals. "But what we can do is go into the game with no stone unturned." Who will face Scotland for Georgia? Read more on Scotland v Georgia: Who will feature for the visitors?